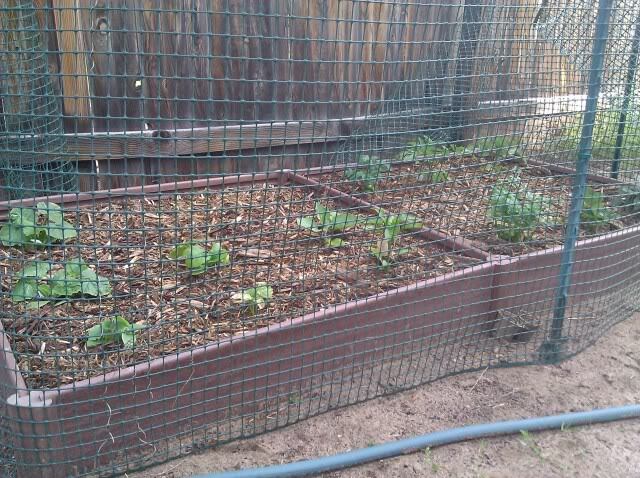 i had to fix our sprinklers and i redid the drip line in the raised bed cause i was not happy with it. 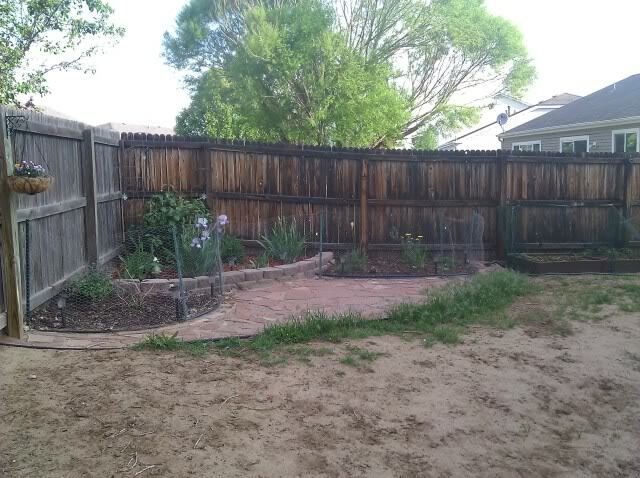 then i went to the back yard and worked on my sad shade corner and a light went off in my head i got a great idea! 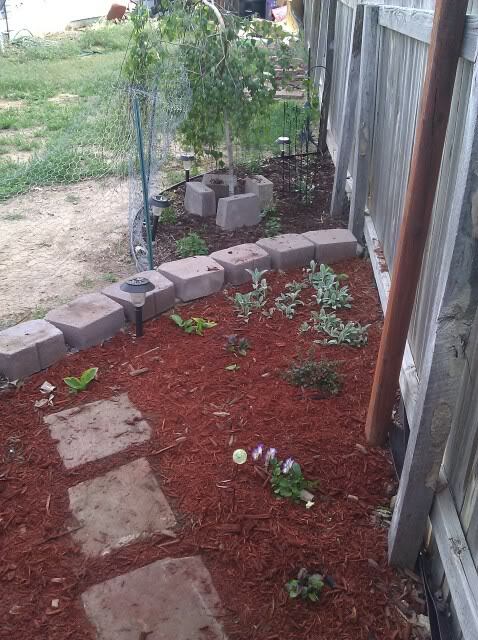 so my thought is if you can beat them join them, Jack and Sierra will always jump into this garden to get the squirrels and i will never be able to grow flowers in the path so i put in a cute flagstone path to the corner for them and i finished the drip hose in here as well. 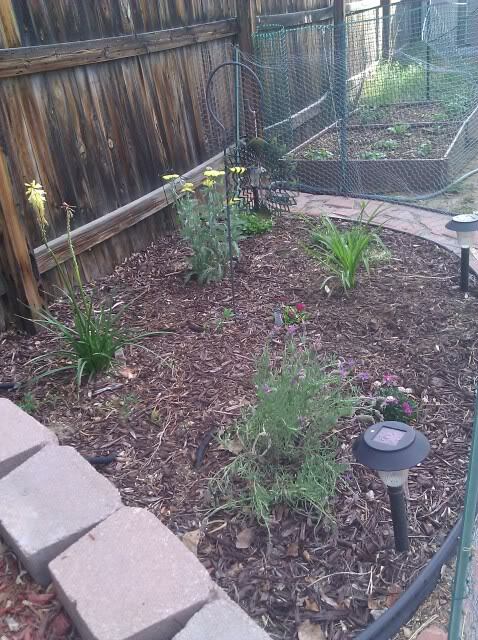 i also got more bungle weed that will spread and planted that as well as some day lilies and cat mint. 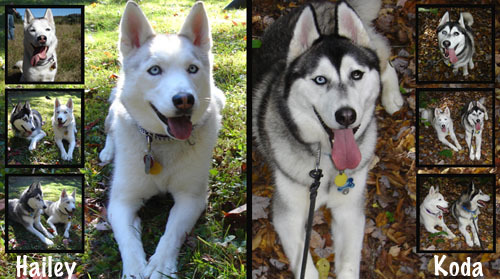 here are some pictures for your monday! 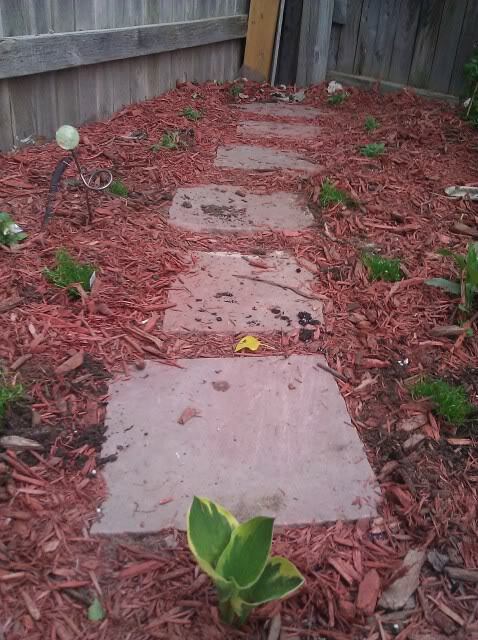 here is the dog path i made, and i need one more bag of mulch for the back. 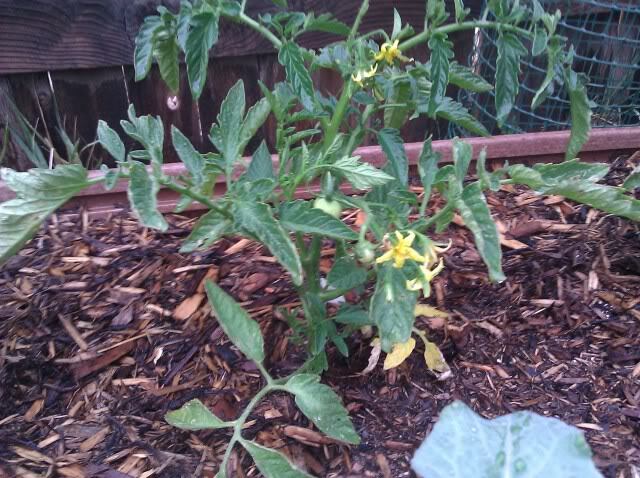 and my veggies, i returned a dead cucumber plant and put a new one in and got come cherry tomatoes. 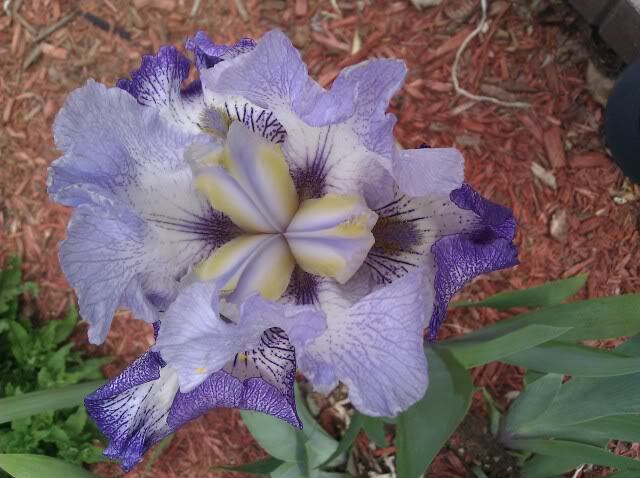 I love your birthday irises! Beautiful! 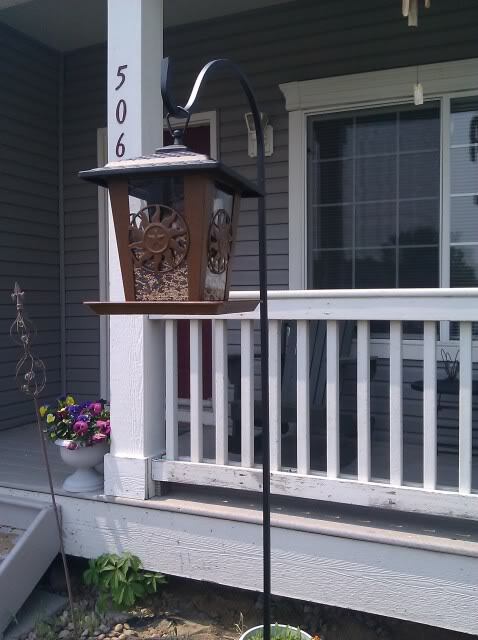 I do so enjoy pic updates of your garden! if you go back to page 5 and look at the front yard pics just a month ago you can really see how everything has started to take off! 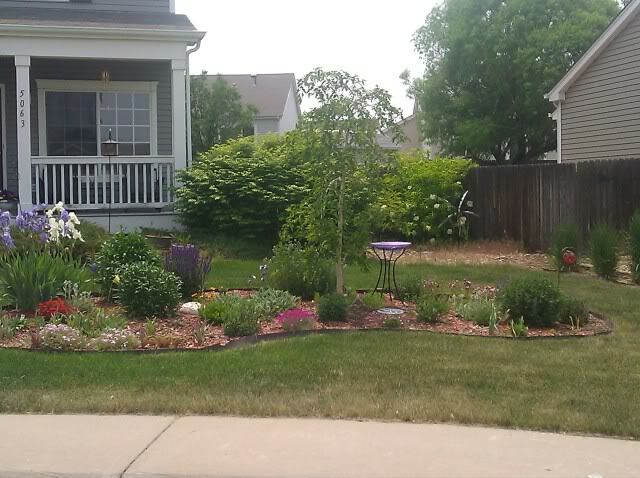 we should be seeing some flowers in the next week or so on most of it so in 17 days we will have had our home for 3yrs so this front bed is 2yrs old and every year i add more to it and every year the past year flowers get bigger and bigger! Val just wait till next season when all your plants come back double in size! 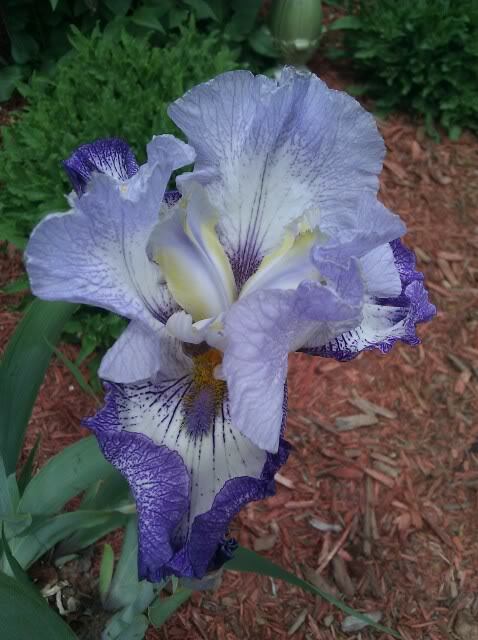 did you take a pic of the irises you bought? Oh I can't wait to see how much better my garden will look after a few years of growing. I haven't had a chance to take pics of my new iris. Hopefully I'll have a chance this coming weekend. how did i miss that Eddy!!!! when Lindsay said you were trying to get the dogs to pee i was hoping she did not mean in the yard!!!!! 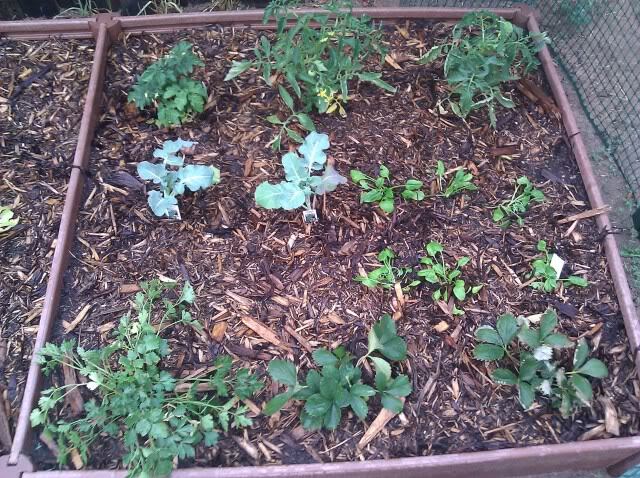 any ways i cant get over how much everything is starting to take off i am truly a happy gardener! they are the to go to people for fun/new/ and kind of high priced plants. with b-day money in tow i set out to see what i could get for $50. turns out with a $5 off coupon and 20% one item i made it out of there for $52! i also spent 2hrs just wondering around there, i have to say not having any "real" things to do it was nice to wonder around and not worry about time! 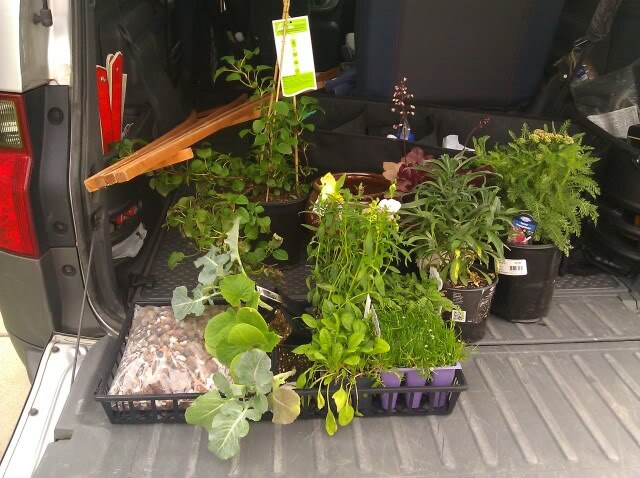 i then went to walmart and got 3 more plants, a red yarrow, coral bell and dont remember the other. 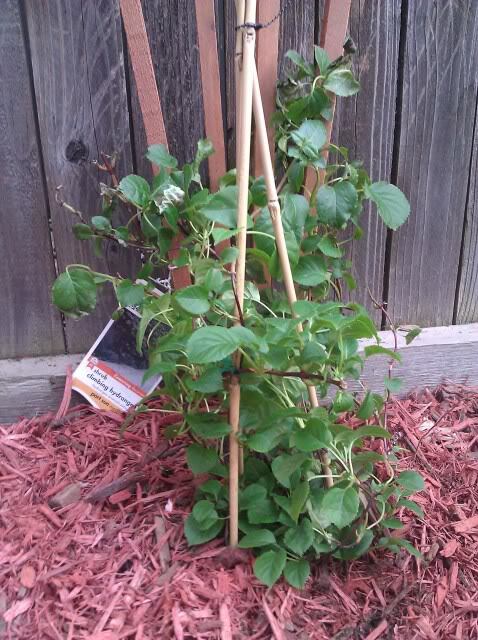 then i went to home depot with gift card in tow and found a what i believe to be a miss marked (in price) climbing hydrangea and trellis. it was a good afternoon of deals and i made it home by 6pm ate dinner and went to work out in the yard as it had cooled off by then. 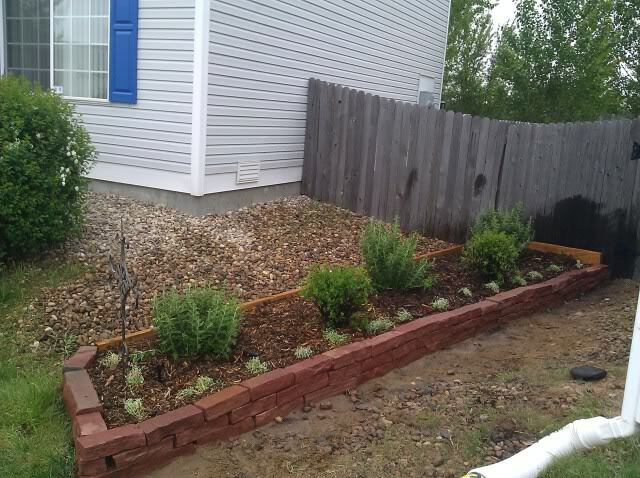 i got all the plants planted and also got the rest of the edging done around the shed and found out our front sprinkler head was not rotating which explained the dried grass i found while planting. i then dealt with that and got soaked, but i think i fixed it. 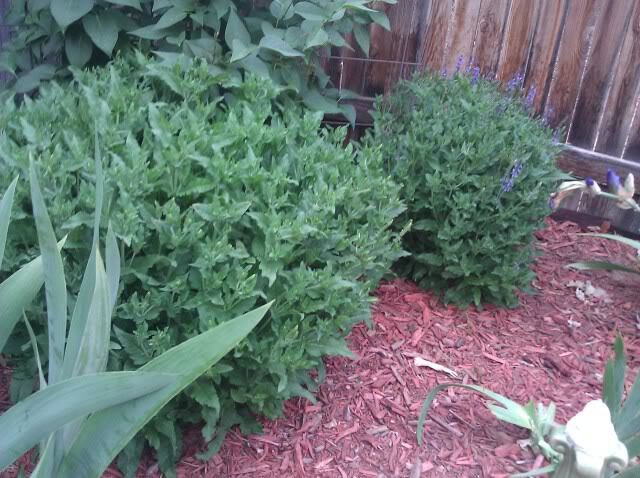 look how huge this salvia is getting! 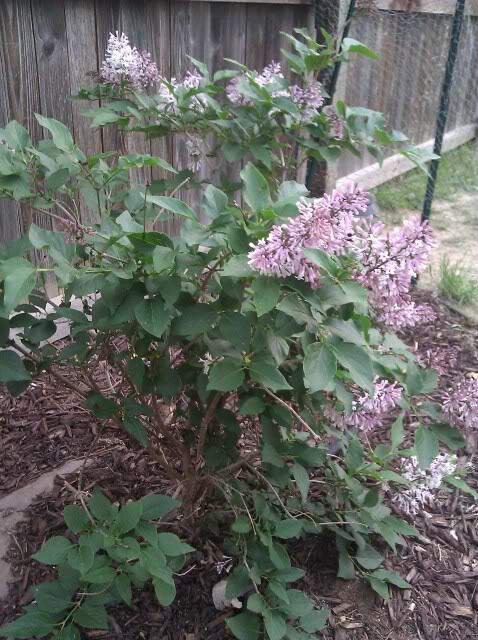 and the Miss kim lilac bloomed in time for my party! hope you all enjoyed my plant spree yesterday! That front bed looks incredible! I'm seething with jealousy here! 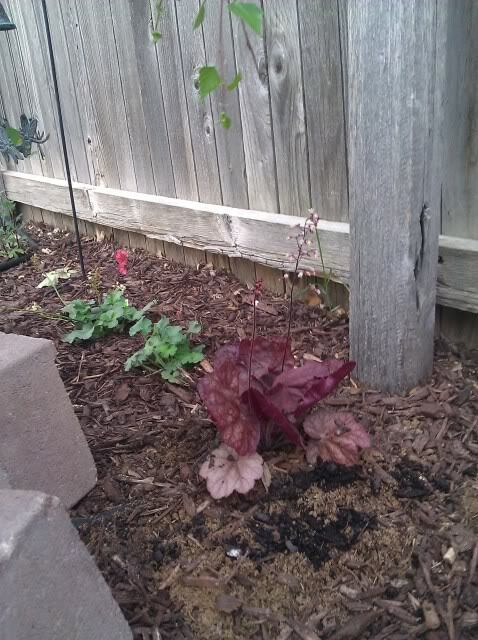 Do you know if the Heuchera coral bells can thrive in full shade or do they need some sun? I have a little section behind my house that gets no sun at all where I can't figure out what to plant there. You did an amazing job, Jenn! Maybe I should hire you to re-do our front! 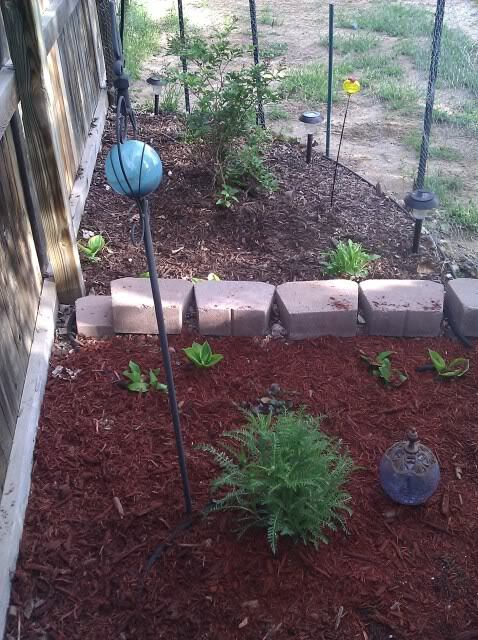 Although I do have to say, the bulbs that I got from Costco that hubby planted for me in the front and around the base of the trees have sprouted - so I hope they bloom. 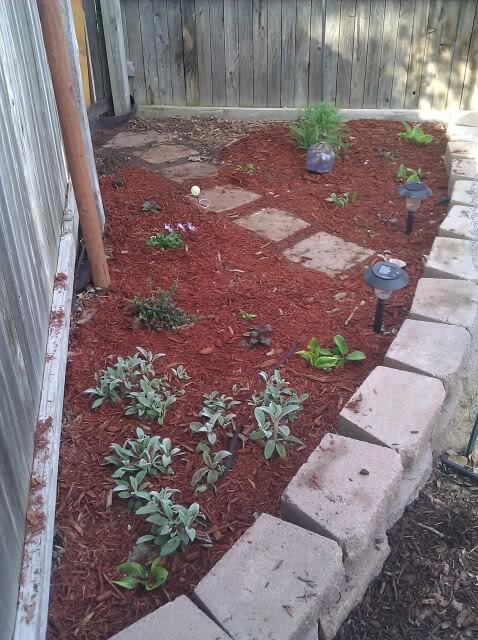 I just wish hubby planted then in the bare spots instead of only along the edges...oh well. 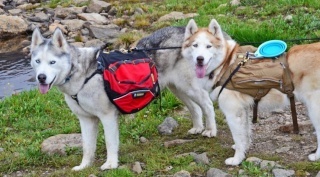 they are meant to tolerate foot traffic and not die! 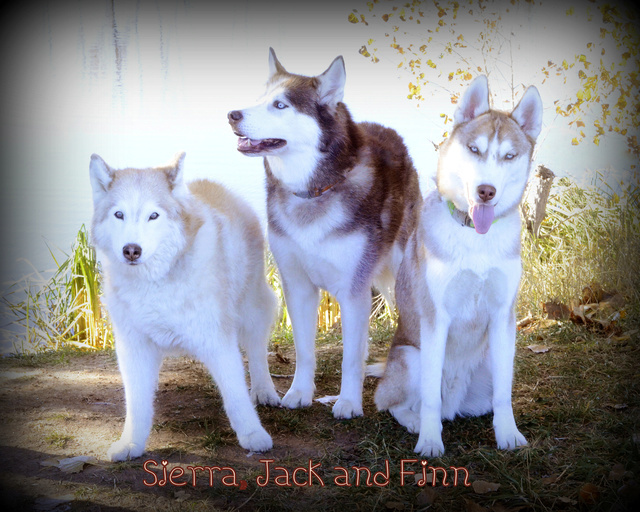 not sure if they are just a CO thing or not. 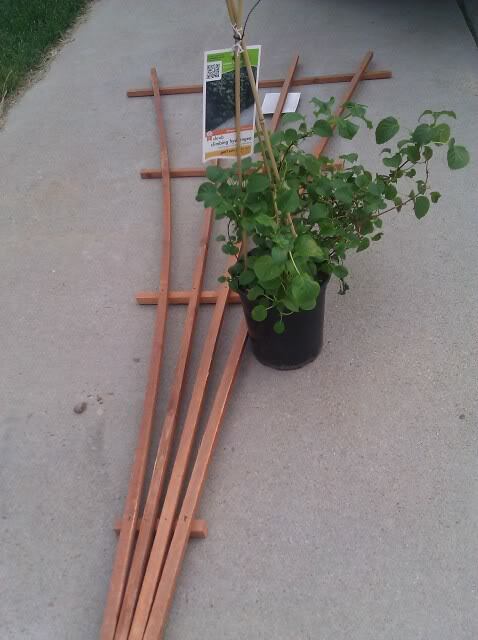 but i saw them last year and have had them on my mind for that shade bed. will let you know how the Heuchera coral bells do. with the weeping birch and the trees from the neighbors this part of the bed only gets a few hrs of sun in the afternoon. 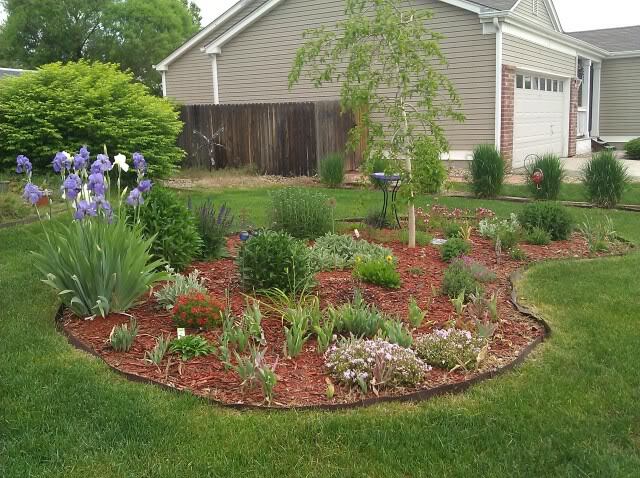 if all these plants fail this year and do not come back up next year i might have to rethink the bed all together as i have tired full shade and part shade/sun plants that last 2 yrs. the only things that came back were my mums, lambs ear, hostas, yarrow and the lilac, everything else is new this year. do you have lambs ear out there? A Word of Caution: Lamb's Ear can be invasive in warmer climates and very hard to eradicate. Check with your local DEC or Cooperative Extension before planting. that might be an issue! 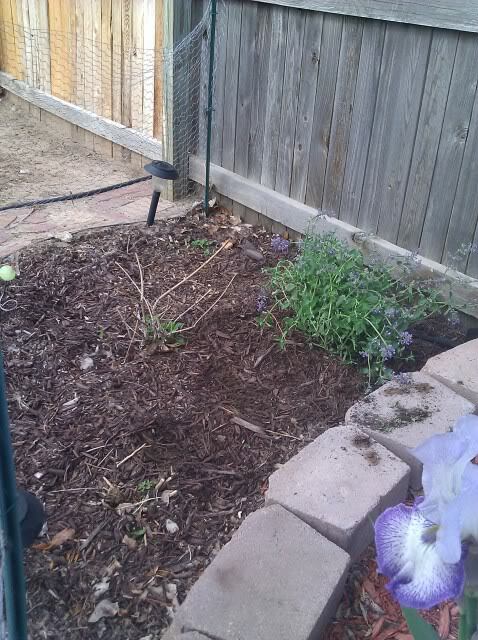 i did plant it cause i want it to fill in all my bare places and i will dig it out when it gets out of control and share it with others! just give me a CC and i will go shopping for you! 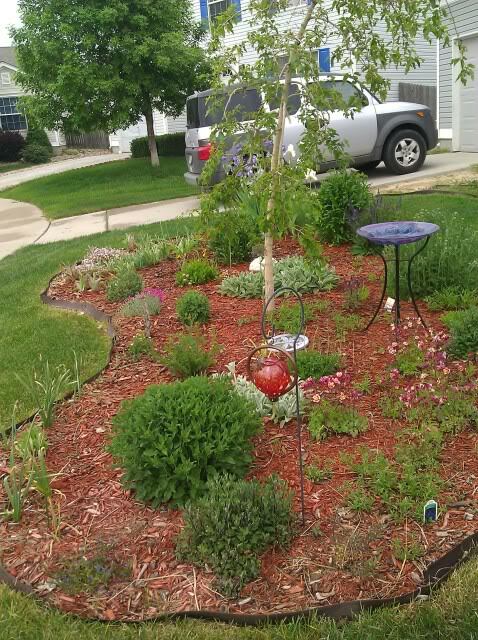 i LOVE buying plants but in CO we are getting close to the to hot to plant anymore part of the year, then its i will buy it and hope the heat does not kill it season. Thanks for the link on the stepables! That is awesome! I will have to look into that more as I am helping my MIL with planning some landscaping for their second house in northwestern NC. We do have Lamb's ear here too, I've considered planting it but I haven't done enough homework on them yet. Yesterday hubby ordered the Better Homes & Gardens Perennial Gardens book for me, I can't wait to get it. I was looking through it at Lowes on Saturday and had a hard time putting it down! 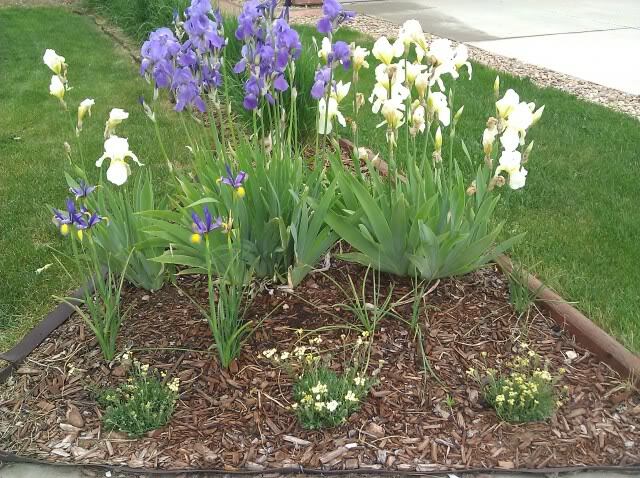 Jenn, since you've got a lot of irises, where would you consider the best place to plant them in the garden keeping in mind our hot summers here? well the front ones are in full hot/dry sun and bloomed first, the ones in the back are part sun/shade and are just now blooming. they are an early season bloomer so for you i think you will have them bloom before your weather gets to hot then you cut back the stems and leave the leaves so the plant can keep growing for next season. they say it takes a yr for them to establish and then the 2nd yr is when they really take off, for me that was true, i planted them in the fall of 2008, last year they were ok, this year OH MY they were huge and smelled like never before, i know i have to split some of them this fall and i don't want to wait another full year to have them look so good. maybe i will wait one more yr.... i planted them before i knew much and put them to close together. That's what I was thinking too, I am thinking the best spot for them will be in the back where they will get morning sun and afternoon shade. 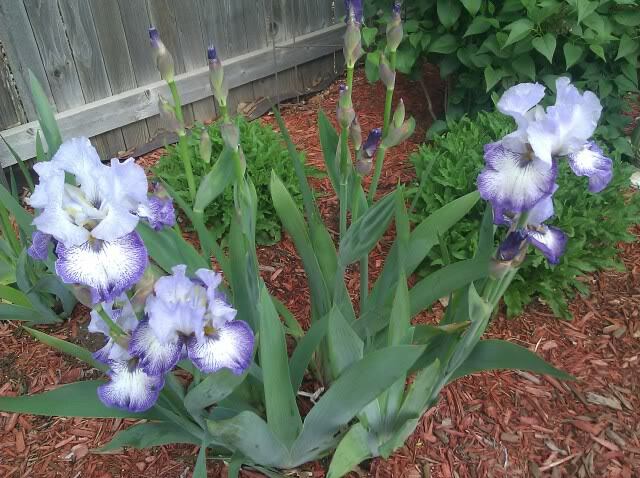 I know a saw other peoples' irises blooming in February and March here but February was abnormally warm here this year so I'm thinking a March/April bloom for Irises is probably more normal for my area. Thanks for the advice! 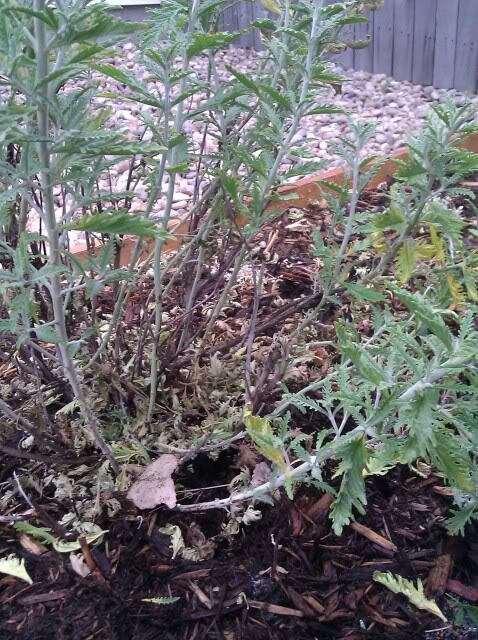 Im worried about my Russian sage plants! im not sure what is wrong with them, i thought they looked ok at my b-day party and my aunt saw them and did not seem worried but last night i came home and noticed that a lot of bottom leaves have fallen off and some leaves are turning yellow. 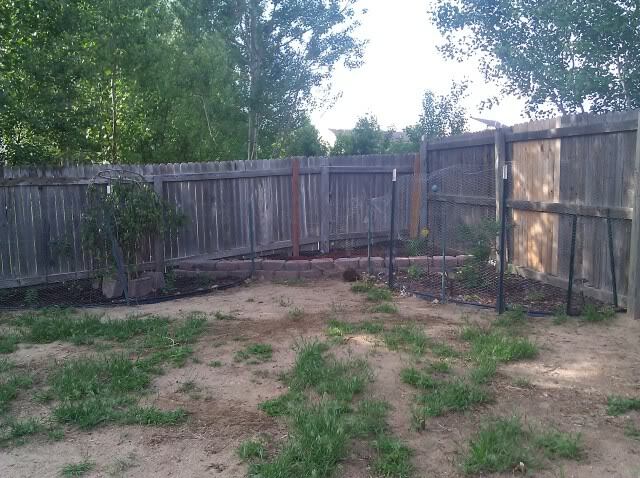 i stuck my hand in the dirt and it was moist, not to dry or to wet, but i only went a few inches not all the way to the base of the raised bed and i know thats how deep the hole went for them. 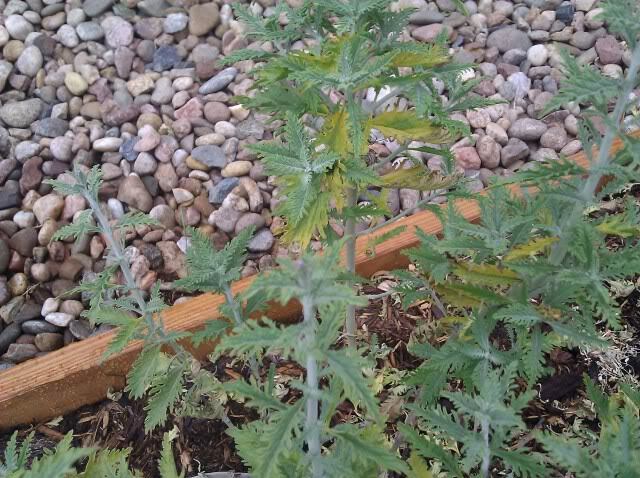 now i think its either to much water or not enough to get all the way to the base, the reason im unsure is the 2 other bushes are doing fine ( none sage ones), one even got a yellow bloom on it! 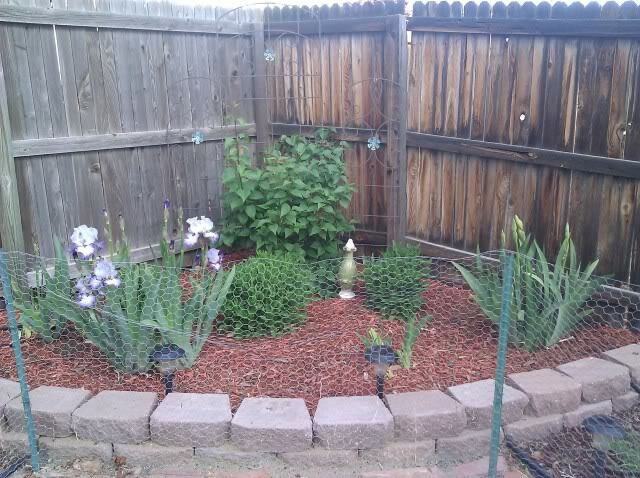 and my snow in summer flowers are doing ok, there is one flower by the middle sage that looks the worst that has died so im leaning towards not enough water.... i have a drip line that has misting heads that spray every other day for 15min in the morning and 15min at night since its the same line as the grass. here are some pictures and maybe one of you can help me out. 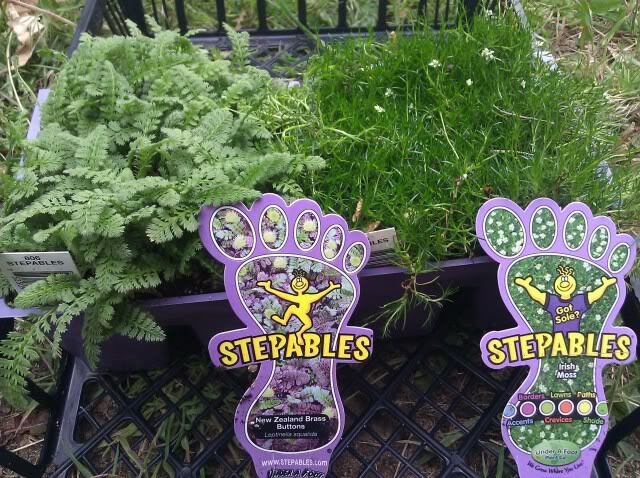 I told JD I wanted Stepables to fill in the bare spots out front in the retaining wall...and off to Home Depot we go on Saturday! i don't think HD or Lowes carries them. the ones i got are for sun/shade, they have full sun and all shade ones as well. Sorry to hear about your Sage Jenn! 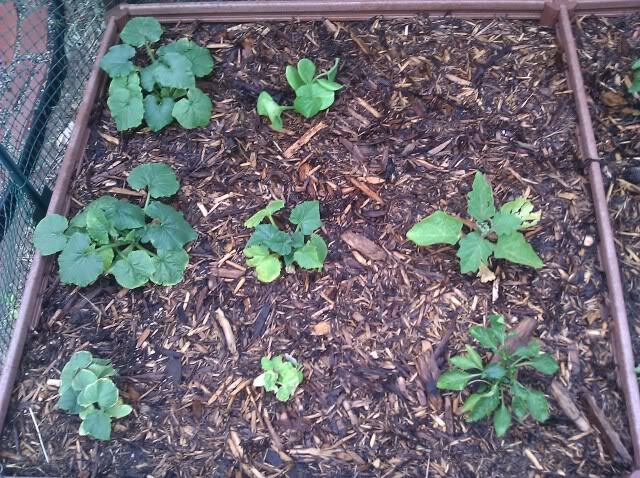 I have no idea, I'm new to gardening. Maybe Lisa will have some advice whenever she pops in. I know how you feel, 4 of my creeping Phlox and my 3 Pincushion flowers are suffering. 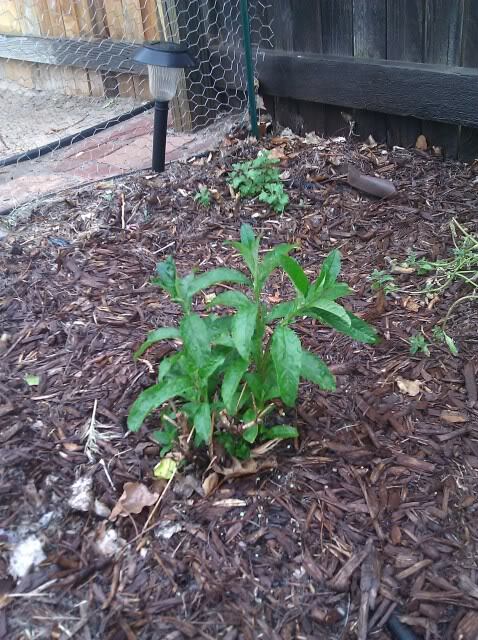 The Phlox are brown or black in the center and green on the outskirts and my Pincushion flowers are browning from the top down. In my case I think the intense heat and humidity are to blame.